My burning question to Mayor Nickels is this: Will you also propose a fee — say, a dime — on those little frozen-food plastic bags that keep the Dreyer’s strawberry ice cream from melting onto my box of Product 19? And what about the plastic bags I use to wrap meat products — keeping the Draper Valley chicken “juice” from seeping onto my fresh ears of corn? P.S. : What in the heck am I going to do without any of those paper bags with the easy-grab handles? I use those for conveniently recycling newspapers and magazines, and for gifting my son’s outgrown clothes to friends’ boys who can use them? So, here’s my question to you Eaters: What do you make of this “Paper? Plastic? NOT!” conversation? 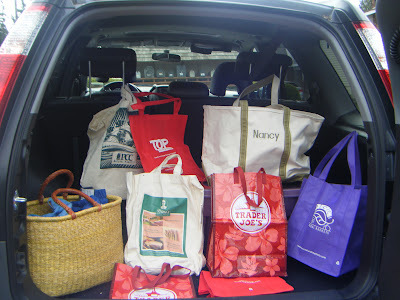 Have you started using eco-friendly bags while grocery shopping? If so, which ones do you like the best? I’m not some eco-freak or anything, it’s just that after reading all this talk about paper vs. plastic, it just seems to make sense to consider an alternative, and those are readily available everywhere these days, for cheap. I like the Trader Joe’s bags with the Hawaiian design-theme, too, which do well with heavier items like half-gallons of juice, or a couple baby watermelons. I think those TJ bags cost $1.99, or maybe it was $2.99. I bought the green-logo canvas bag (front and center in the photo) from Petosa’s, a great little family-owned supermarket in downtown Edmonds. I paid something like $14.95 for it, and while that sounds like a lot for a grocery bag, the deal was they’d give you 25-cents-off your purchase every time you use it. It paid for itself pretty quick, seeing as that’s my go-to store when I’m doing quick last-minute shopping or missing a key ingredient or two. I’m not much on monogramming or logo-wear, but when my neighbor Leslie, who has a summer home in Maine — ancestral home of L.L. Bean — bought me that sturdy L.L. Bean canvas bag with my name on it, I gave her a big thanks in return: it’s a terrific beach bag. That greenish straw number (bottom, left) came from a farmers market stall. That’s my most expensive bag ($25), and my prettiest, don’t you think? It used to be a deep chartreuse color, but it’s faded considerably. I use that so I’ll look cool walking in the farmers market, and because if I need to put my bag on the ground to help myself to a bunch of gorgeous flowers or something, it doesn’t fall over.